It’s time for you to sell. I know that’s scary. Many of us have a bad association with the word “sell”. It leaves a bad taste in our mouth because of past experiences with salesmen. But the difference between you and a salesman is that the salesman’s entire job is to sell. If you have a bad experience, it doesn’t affect them because you’re talking to customer support. Their sole goal is to get you to sign on the line that is dotted. Often this means doing whatever it takes to get you to buy. We don’t like that and we don’t want to be like that person. But you’re different. See, you made this thing you’re selling. You’re not selling someone else’s product you don’t believe in. You’re selling something you made to better people’s lives. People will benefit from what you created. If you don’t learn to sell, people will not buy. Where does that leave you? Ultimately, it leaves you without a business. If you don’t make money, you can’t operate. Guess who loses? Everyone. Everyone loses when you don’t sell. Your potential customer doesn’t benefit from the value you have to offer and you end up running your business into the ground which means not only are you out of a job, but you can no longer help people! That’s where today’s episode comes in. I’m here to de-stigmatize the word “sell” for you. I’m going to show you why, when, and how to sell without feeling awkward. People need to pay for stuff in order to value it. Source your desire to sell from your desire to benefit people. If you’re not selling, you’re decreasing the chances that people who receive your material are going to value it. You’re not selling your product or your thing—you’re selling a better version of your customer. You can’t give away free stuff indefinitely. If you invest in your first customers and give them personal attention, they’ll become your ambassadors. You making money is a byproduct of improving other people’s lives. When someone buys from you and you do not up-sell them, you’re leaving money on the table. If you want to be an expert seller of nice-to-have products, you need to be an expert story-teller. You have to earn the right to think long game. To re-sell an old product, tell the story different ways in different mediums and then provide unique value around it. Always be providing value, but always be selling. 03:55 Sean: You need to start selling, but you feel awkward selling and you’re not sure how to go about doing it. That’s the purpose of this episode—we want to help you with that. 04:04 Ben: Awkward may not be the right word. You may even feel guilty, gross, icky. 04:26 Sean: You can value something that you got for free, but it’s much less likely that you will. If you don’t believe me, tell me if I’m wrong. You’ve got a folder on your Dropbox called PDFs or Ebooks, and it’s got all these eBooks and stuff that you’ve downloaded. Everyone else knows what I’m talking about. I guarantee that you haven’t read 80% of those files. Maybe you opened the file and thought, “Yeah, that looks like a good book,” and then it goes to collect some eDust. 05:37 Ben: Are you talking about people who offer stuff for free in exchange for signing up for their newsletter and that kind of thing? I sign up and I get the email, and then I never open the email. 05:50 Sean: You get this free eBook and you don’t read it. What happens when you go and buy a book or a course? You’re much more likely to actually consume that, because you’re determined to get your value out of it, because you’re invested. 80% of the paid material you’re inclined to go through. People need to value something, they need to pay something, they need to have skin in the game. They need pay to play in order to be able to value this thing. In this episode, I want to help people shift their mindset on selling, why it isn’t a bad thing, why you need to sell. 06:39 Ben: In turn, people will actually experience a benefit from it. 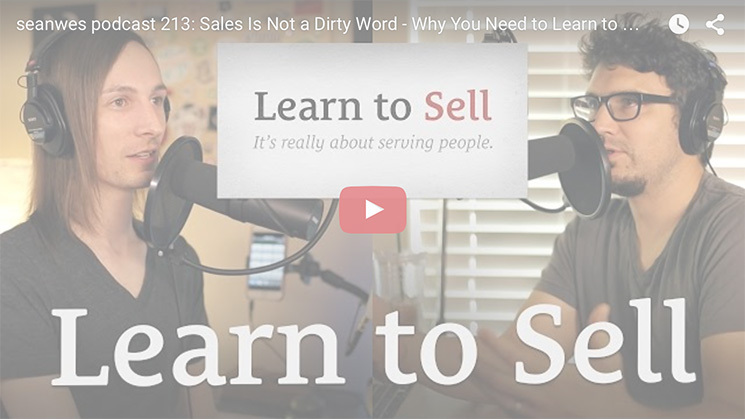 07:12 Ben: I want to talk about the reasons we think of sales as a dirty word. If Kyle is using that as an excuse, it’s probably because he already has some negative bias toward the word “sales”. If you’re thinking about selling something, you have a product or potential things you could sell, what is it about that word that makes you feel that way? Can you get to the root of that? Was it an experience you had? Was it someone that you knew who went about it the wrong way and made you feel uncomfortable because of the way they were selling? Is it the culture of sales and the general perception of it? Identifying that is one of the first steps to get over those ideas and move into a healthier mindset. 08:27 Sean: Aaron says, “Why do so many people feel guilty about selling?” Kelsey says, “How do you talk to people without coming across like a sleazy sales guy when you intend to share a product or service for their benefit? Why do we feel awkward, why is there this stigma, why do we feel guilty?” We all picture that slimy salesman, they’ll do whatever it takes to make the sale, they’re going to take advantage of you, and all they want is your money. These people are career salesman. Their job is to sell, and that’s it. I’m here to get you to sign on the dotted line. If you have a problem, talk to customer support, not me. 09:07 I’m here to get you to sign, I want you to buy. That’s my job. That’s why we feel that pushy-ness. That’s the thing we don’t like, and we associate that with sales. When it comes to you, you made this thing for someone and you want it to help them. You’re trying to solve their problem and benefit their lives, and that is the place you come from when you’re selling this thing. If you do not sell, they won’t buy, and therefore they won’t benefit. You aren’t a sleazy ad hoc salesman because you’re the person who created this thing in the first place, so you have a more genuine desire to help your customer. 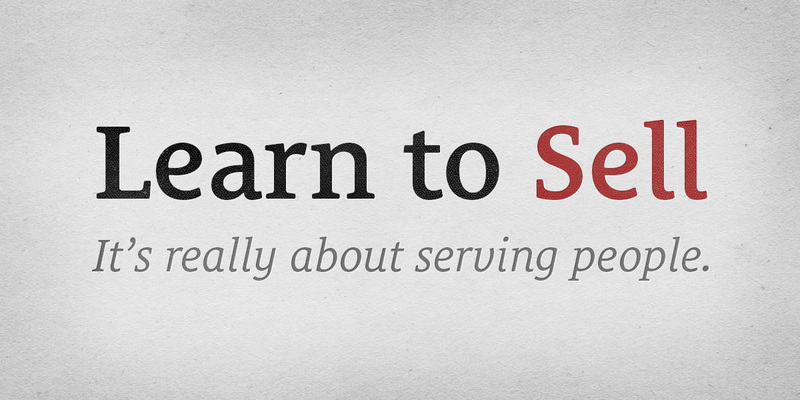 You have to source your desire to sell from your desire to benefit people. 09:56 Ben: When I was a younger man, I worked for Wells Fargo, and like pretty much any retail bank out there nowadays, they had sales goals for their team members. Depending on what position you were in, your sales goals differed, because you were able to offer different products and services. Every quarter, you had to meet a quota. They want to justify that position by making sure that you’re bringing profit to the bank. When people came in the door, your job was not just to give them what they were asking for, but to push beyond that. The thing that made me feel so uncomfortable was sitting across from college students, kids who had just graduated and were about to go to college, and there was a huge push to give college students credit cards. 11:03 I know what’s really going on. I know that it’s all about how if they don’t make their payments, their interest rates go up, and it’s more profitable for the bank. I can’t personally get on board with that. I felt such a conflict. I didn’t believe in what I was selling or agree with that as a benefit to the customer, so I always felt like I was going against my values. Ultimately, I left that situation. When I sell now, I remember that feeling. The echoes of that experience still hold onto me, but I push past that because this is my thing. My goal is not to put my clients or customers in compromising positions that I can get the most money out of them. Regardless of what it ends up costing them in the long run, my goal is to provide value, something that’s going to make their life better, and help them reach their goals. It’s something that I made, so thinking about it in those terms helps me get over the negative experience I had. 12:36 Sean: There are a lot of things going on here. People are trying to accomplish something, you’re wanting to help them, and you’re also wanting them to help themselves by making a commitment that will result in them actually applying the knowledge of this thing that they get or using the tool that they purchase. You could keep giving free value over and over, but there’s a couple of issues with this. Number one, people will fall into a pattern of consumption and no application or execution. They don’t have anything in the game, they’re not invested, so they’re not going to act on it. You can’t give away free stuff indefinitely—you have to survive, your business has to make money, and you need to make a profit. 13:30 As Gary Vee says, “Cash is oxygen.” You have to make money, and in order to make money, you need to sell. If that seems selfish to you, then get out of business. I will help you spin this so you see that it’s not completely selfish to make money. If you really want to help people, you have to be sustained in doing that. If you want to help people once and never again, fine, give it away for free. Run your business into the ground and then be done. If you want to continue helping people, you need to sell. If you want to be able to continue helping people, you need to make money and support yourself, which is why you need to sell. We’re going to talk about the right time to sell, what you should sell, how to sell nice-to-haves, how much you have to give in the first place to sell and whether you do, as well as a bunch of other questions. 14:38 Ben: If you really care about people, it doesn’t matter whether you have a product that helps people be more profitable and reach their goals or if you’ve got something that adds beauty or is entertaining in some way, if you want to allow people to experience that without an end date, then selling is necessary. You can’t just give away all of your stuff. 15:57 Ben: Rachel and I have been watching a video series, a summit put on by Michael Hyatt, where he was talking to different people in the content creation industry. I think Donald Miller said, “You want to make the customer or the client the hero of the story you’re telling.” You’re not the hero. It’s not about elevating yourself. It’s about saying, “The product or service I provide, the art that I create, is meant to allow you to have an experience that puts you as the hero of the story.” I love that way of thinking about it, because it effectively gives you permission to sell without tooting your own horn, because you’re shifting the focus to somebody else instead of yourself. 17:00 Sean: Kyle says, “How do you overcome the feeling that your audience is too small to sell products to successfully, and when is the right time to feel that way? Should you ever feel that way, essentially?” No audience is too small to sell to. Starting with an audience is great, but you would be surprised by the number of businesses that make great money and really don’t have an audience. We’re kind of audience-first here, that’s how we like to do things, because it’s more of a long-game play. It can be very beneficial in the long-run. Eventually, you can be in a really good spot. You can continue to launch things associated with you and your reputation, and people will continue to buy them because they’re associated with you. 17:48 You have this audience that is supporting you. It makes launching things in the future a lot easier when you start with an audience. You don’t have to have an audience to sell, you just need attention, and you can get attention by buying it. You can pay for ads and drive traffic to a page where you sell a product that makes someone’s life better, and they don’t even need to know who you are. As long as you’re making more money selling the product than getting the attention in the first place, you’re in business. How many of us have a personal relationship with or follow our plumber on Twitter? We just looked it up. We found a plumber because he advertised in a place we looked it up. He somehow got you to come to his website or see his listing in the Yellow Pages, if anyone uses those. He is trying to get you to notice his services, and for a lot of us, those services solve our problem well enough that we don’t need to have a relationship. That plumber doesn’t have to have an audience to be in business. 18:59 Ben: Even if you have a small audience, when you create a product and sell it, that becomes a form of social proof. If you’re looking at somebody’s website and they’re just giving stuff away vs. selling a product, you see it differently. Let’s say you launched a product to 10 people and two people purchased it. You put a lot of value into this, and this is very important. The product you make for your small audience is for your small audience. Whether your audience is 10 people or 10,000 people, your product is for a person. You’re not thinking, “I’ve got to make this to appeal to a mass audience,” you’re making it for a single person. If you focus like that, the two people who actually purchased it will have a really good experience. Maybe one of those people leaves a review or writes a testimonial you can now share on your website as a form of social proof. As you continue to provide free value, people come to your website and see that, and it benefits you. That’s not to say that you should sell early, but that can be one of the benefits of selling even when your audience is small. 20:36 Sean: A lot of us think, “I only have 10 subscribers. What’s the big deal? I’m not that important.” Well, 10 people care about what you have to say. Why don’t you care about those 10 people and build relationships with them so that they become your ambassadors? They’re the people who are going to take you from 10 to 100, 100 to 1,000, 1,000 to 10,000. That’s why those people matter. Keshna says, “I know I have to sell to make a living, but how do I make quality products people want?” No matter what, you have to do your research. This is why I like building an audience, because you can tap into that audience and have conversations with them. You can give them something free or sell them one product that makes two sales that starts a conversation. 21:21 Maybe you just start with a newsletter. You don’t even sell anything, but you start a conversation, figure out what their struggles are, and help them solve those things. This is why I like starting with an audience. If you don’t have an audience, you still have to do the research, you just don’t have an audience to tap into. You have to go find the people and figure out what they’re struggling with. 21:45 Ben: Either way, it takes time. That’s the big factor here. Building an audience first is such a good thing, especially if you’re investing in them and developing relationships, because the depth of the relationship takes time. The more time you spend with people, the more you understand the things they’re struggling with, the more you understand their specific needs, and the easier it will be for you to tailor something that meets those specific needs in an effective way. A product you could make two months into a relationship with 10 customers could provide a lot of value, but it won’t provide as much value as a product you release six months into a relationship with 20 people, where you’re really getting in deep. If you can make the solution you’re offering immediately obvious to people, then you can sell without providing value first. 23:20 You can do that. I know we’re all about audience first, providing value first, and Rule of Reciprocity, but you need to understand that this is a very long-term play. We’re playing the long-game here. That’s the whole value-first thing. Way later on, it’s going to really pay off. It’s going to pay off when you have thousands of people who have received a ton of value from you, and when you go to sell something, they all buy it. That’s something these other people who don’t provide value cannot do. Even if they want that much attention, they’re going to spend thousands of dollars to get the attention, and those people are not primed. There has been no reciprocity credit that makes them primed to buy whatever it is that you’re selling. 24:09 It’s very different games. If you’re thinking, “These people followed me to see my work,” or, “They followed me because I teach them about this topic, so I shouldn’t sell,” you’re thinking about selling selfishly. Yes, selling benefits you and makes you money, but you’re not going to do well unless you understand that the only way you get that money, the only way you sell successfully, is if you’re actually caring about other people benefitting and making their lives better. You making money is a byproduct of improving other people’s lives. If you don’t get that, selling is not going to work for you, because you’re going to feel dirty or guilty about this thing. Once you realize that this is about bettering people’s lives, selling to them is doing them a service. If you’re not selling to them, in this scenario, you’re doing them a disservice. 25:15 Steve says, “After someone has purchased from you, do you need to start the reciprocity cycle?” Do you need to start the reciprocity cycle over again and provide additional value to that person in order to sell to them again? No, you don’t (Related: e173 Relationship Marketing 101). How soon you sell to them is going to surprise you, because the answer is immediately. When someone buys from you, when do you sell to them again? Immediately. 26:04 Ben: Because of another rule. I can’t remember the name of it, but if we behave in a certain way, we have a tendency to continue to behave in that way. Amazon takes advantage of this. I was just on Amazon the other night, because Jadon and I have snuggle time once a week, and for our snuggle time, he wanted to fill his Wishlist with stuff that he wants. He’s got a birthday coming up. Amazon pops up this little thing on the side of the page that said, “You’ve purchased this before. Would you like to purchase it again?” You’ve already done this, so you might as well do it again. It was an item that was really a one-time purchase, so it would have been silly for me to purchase it again, but the idea is the same. We have a tendency to continue to do the things we’ve already chosen to do in the past. 27:09 Sean: That’s why a lot of people have started to use pop-up boxes for email sign ups, not because they go right in front of your face, but instead of a sign up, they’ll have a button that says “Download.” You click on that, and then a pop-up comes up asking for your email. It’s this micro-yes. You need to have products that improve people’s lives and deliver 10x the value on the price you’re asking. 27:59 That’s the first step. You need to have products that are actually valuable to people. We’re not talking about taking people’s money—you need to make their lives better. Let’s say I have something I’m selling for $1,000, and I think that this will make you $10,000. Once you learn how to work with clients, how to build a sales funnel, or how to market products, this is going to make you a lot more money than you invested in my $1,000 course. That needs to already be a fact. I need to know that. I need to believe in this. Before I up-sell someone to a higher ticket item, I need to know that it will provide them value. 28:41 I need to convince someone, to sell them on the fact, that this is going to provide them with more value than they’re going to invest in this. You need to have all of this in place. Back to Steve’s question, “How soon can you sell after you just sold to someone. Do you have to start the reciprocity cycle over again?” No, when someone buys from you, you can immediately up-sell. You take them to the next level. I just signed up for a $1,000, 3 day conference. Gary Vaynerchuck is going to be there, as well as a few other people. I’m not talking about what conference this is because I’m still not sure about it. I’m going out on a limb. 29:43 There’s this spectrum of online marketing. There’s very genuine, very real marketing, which is what I do. I see myself as completely on one side of the spectrum—I want to better people’s lives and sell them things that will benefit them, are of good value, and will deliver 10x or 20x the value. I like to be transparent, honest, and genuine. On the other end of the marketing spectrum is the sleazy salesman who just wants your money and wants to swindle and cheat you. There’s everything in-between, and I wade through a lot of it to bring you guys the good stuff based on core principles. 30:33 Ben: If you’re coming at it from your values, all of the tools that sleazy salespeople use to manipulate people are tools that, from the right set of values, help people who would otherwise have a difficult time getting over their own hurdles actually experience a product that is going to better their lives. You aren’t using those tools in a manipulative way to try to get people to buy something that’s not going to provide value, you’re just trying to better their lives. If you wade through the sleazy stuff, you can find great information to use from the right set of values. 31:31 Sean: Maybe that can also help remove some of the stigmas from certain tools, like, “Oh, this tool is bad because I’ve seen someone do bad things with it.” Maybe a tool is just bad, a tactic you don’t want to use. Starting with your values and your principals, you can sift through it. It helps some of the stuff fall to the side. I’m wading through this stuff, trying to bring the tactics, approaches, and methods that really work in a way that’s genuine, valuable, and helps people. I think this conference is good, but it’s certainly not all the way on this side of the spectrum. I don’t want to say what conference it is because I haven’t been yet, and I don’t want to seem like I’m giving it my endorsement. 32:24 I try to keep an open mind and take a lot of things in (Related: e198 Keeping an Open Mind). I bought this ticket, it’s a $1,000 for this conference, and immediately after I bought, there’s a page with a video and a button to purchase a VIP ticket. The VIP ticket has a number of things: the first several rows are blocked off for VIPs, so of hundreds of people you get the best seats. You get access to a separate room, the VIP room, where they’re also streaming the event. You could hang out there the whole time if you wanted, but when the speakers are done, that’s where they go. They can’t shake 500 people’s hands, so this is an upgrade. That room is catered, you get to go to a special dinner. For someone who wants to meet the important people, they can pay more and they can get that access. 33:23 I did not purchase this, but I’m observing the tactics here, which is the approach of up-selling. When someone has just purchased from you, they have made a commitment, a micro-yes, and they are much more likely to make another yes. In this case, I could see what they were doing, but they were offering more value in exchange for more money. It’s just not leaving money on the table. 34:01 This is all built on the foundation that your products actually help people. They need to be of good value, you’re not just taking people’s money. If that is the case, it is your duty and obligation to sell people on a product that will better their lives. That doesn’t mean that this is for everyone. The VIP ticket is not for everyone. For some people, this is their first conference, so they just need to go and hear these people talk, and they’re going to get a ton of value. They’re going to meet some great people and get all kinds of value. 34:35 Other people may have seen these guys speak a ton of times, maybe they’ve gone to 50 conferences this year, and they want to meet people who have some serious leverage growing businesses. They have an eight figure business and they want to get to nine figures, so they need to get inside these guys’ heads and ask them questions. For that guy, the VIP ticket is valuable, it’s a good deal. It’s smart to up-sell someone, because not everyone’s going to buy, but offer more value to the people who can afford more value. 35:09 Ben: Part of the equation that’s important, too, is what happens before the sale. You set a precedent for providing value, disproportionate value. When someone purchases from you, it’s not like they need to experience it first and once they’re convinced that there’s more value in this thing than what they paid for, then you can up-sell them. We’re talking about up-selling immediately. Before they even have an experience with what they purchased from you, you can still leverage that up-sell and provide even more value. 35:49 You’re either on the side of the person who’s giving more or the side of the person who’s receiving more. There are plenty of people out there who are selling effectively but are on the wrong side of reciprocity because they aren’t providing as much value as they’re charging. If it’s one of your principals to always out-give your customer, whether you’re giving free value or selling something, your goal is to stay on the right side of reciprocity, because you want the value of what they experience to be disproportionate to what they pay for it. 36:56 Which one is the best depends on so many situational factors. It depends on what your goals are. Are you trying to make the most money? Are you in a day job? Are you trying to quit your day job? Are you trying to get money in the short-term or build up something greater in the long-term? Client work or services is the best way to make money quickly. You get paid for a service, you’re done, you’ve got the money. Products take money to invest in, but you can eventually build a product empire that is automated and making you a bunch of revenue over time, but it’s going to take you years to get to that point. Knowledge transfer, or teaching, also can be very lucrative, but it’s predicated on having a knowledge and having experience, which is usually why I recommend that being third. The first two, services/client work and goods/products, bring about that audience and that experience, which is something that you can transfer to people. 38:19 Ben: It really does depend on a lot of things. What are your goals? What are your circumstances? What do your customers need or want from you? Those three questions will help you narrow down on what to start with. 39:07 Sean: Yeah, because there’s so many variables. How Do You Sell Nice-to-Haves? 39:16 Your toilet running is not a nice-to-have. You’ve got to have that. A nice-to-have would be yet another shirt in your closet with a cool design. That can be something that’s hard to sell. Scott says a course is a need-to-have, but that’s hard. Do you need to have a course? Maybe not, but it’s a little bit easier to sell a course than it is to sell something like a shirt. The return is much more clear. Scott asks, “With a need-to-have like a course, it’s easy to point to the value your audience will receive, but the want-to-haves or the nice-to-haves like a t-shirt don’t have the same level of value. How do you sell these want-to-haves? I like how Sean incorporates his Show Up Every Day and Hustle products with a lesson.” You might think “Hustle” and “Show Up Everyday” are just things I talk about all the time, but they’re products. 41:24 You can buy a t-shirt that says Hustle on it, or you can buy a print that says Show Up Every Day. Those are things that I talk about, so Scott just answered his question himself. Story, story, story. You have to tell stories. If you can create a product from a piece of your story or bring a product into your story, that is a great way to sell it. I talk about the hustle all the time here on the podcast. I haven’t even publicly announced or launched it, but I made a shirt that says Hustle with custom lettering, got 100 made, and I had a notification list. 42:24 I announced it between 6pm and 8pm on the newsletter one night, not even social media, and it sold out overnight. All the shirts are gone. We can only say that’s because it aligned with my message. It wasn’t me just writing a random word, it aligned with my message, and people bought into the story. 42:55 Ben: Even though that is a t-shirt, it’s art, there’s a practical element to that. When you see the word Hustle, it reminds you that you want to focus, that this is in line with who you are. You’re the guy who hustles, you’re wearing the Hustle shirt, and you’re hustling today. When they come out with a new Marvel movie, I have to watch it in the theater. It all started with the first Iron Man movie, and they hooked me. I have to know what happens with these characters. I have to go see the new Star Wars movie in the theater. Sure, it’s a nice-to-have, but I have to do it. I will look back with regret if I don’t. What is it that makes that such a necessity for me? Nice-to-haves feel like necessities because you’ve bought into the story. 44:37 Cory: The only reason you’re going to buy a shirt that has a plus or an ampersand on it is because there’s a story behind it. You have that power as the seller to make it valuable, because you can make people think a certain way. It may seem like this nice-to-have isn’t bringing them money directly, but you’re sending a message through this t-shirt or, for me, this film. You’re giving people a mindset about something that can change their course in the end. It could be a small thing like a t-shirt or a film, but in the end, you’re instilling a message inside of them, and there’s value behind that. 45:19 Sean: The less obvious the message or the value is inherently within itself, sitting there on a table without you being there, the more there needs to be story. You can always do story. You can do story about an iPhone, and Apple certainly does, even though the device itself can solve a lot of problems for you. They still tell stories. Imagine your family across the world, you don’t get to see them, but you still get to sing them a song—they try and appeal to this emotion. You can always use story, even if it’s not a nice to have, but especially if it’s something that doesn’t inherently display or communicate the message or value, that falls on you. 46:11 Ben: With those movies, they’re actual stories. They’re selling movie tickets, but they’re using a story to do it. I haven’t thought about it that way before. I feel a little duped, but I still have to see it. 46:30 Sean: Brookes says, “How do I present something with an audience model, like a comic, as something that will provide the reader with value outside of the obvious entertainment? How can I provide them with something that can benefit them personally outside of said entertainment?” You’ve got to reset, Brookes. Entertainment is value. Use your unique advantage. Entertainment is your strength—own it! If you are not a very practical, problem solving, product business, and you’re more of a nice-to-have or entertainment business, then own it. Don’t worry about making it seem like someone buying this comic book from you will also have it help them unlock their door. It doesn’t. That’s not what it’s supposed to do. 47:25 If you really want that very practical, obvious, meaningful, tangible value return, then get into a different business. Change your business model. If you’re about entertainment, go all in on entertainment. That is your value, and entertainment is value. If you don’t believe me, look at your iPhone home screen. Look at your apps, and you’ll find tools that solve problems for you as well as entertainment. You will find the things that provide you value on your home screen. 48:10 Ben: I have a video folder and a music folder on my home screen. I purposefully put my social folder on the next page, because I didn’t want to be constantly tempted to look at it. It doesn’t stop me, though. 48:27 Sean: Brookes says, “Follow up, so a newsletter that simply delivers the new comic is a good newsletter?” Yes! If the comic is providing entertainment value and the newsletter is for people who read the comic, yes, it provides good value. If someone’s paying for the comic and you deliver the comic, yes, that’s good value. You have to earn the right to think long-game. 49:24 That changed it for me, because that’s the mode I default to. That’s not the mode everyone defaults to, but I need to see thinking long-term as a privilege, as something I have to earn by focusing on the short-term enough to keep my business afloat. 49:42 Ben: That’s a great way of thinking about it, because a lot of people want to think long-term because it’s something they value. They hear us talking about it, and they think, “Yeah, I would much rather think about long-term things than focus on short-term things.” You do have to earn your way. There’s a lot of work that goes into getting yourself to a place where you can even think about long-term things in a way where you can actually do something about it. The things that you’re working on now do influence the long-term, but this is where The Overlap Technique comes in. You can afford to give away free value indefinitely as long as you’ve got something covering your bills. You could do that. 50:40 Sean: That’s kind of what I’ve tried to do, because I believe I’m building up enough reciprocity. I started seanwes in 2010, so it’s been five years now, but serious value started more around 2013, so we’re just starting out. You’ve got to stay alive. 51:11 Ben: Does it reach a point of diminishing returns, where you continue to build into that reciprocity, but if you don’t sell by a certain time, the reciprocity begins to lose its effectiveness? 51:20 Sean: That’s a very interesting point. I don’t know, but I can only imagine that’s got to be a factor. If someone feels good will toward you and they want to pay you back for something and you never give them a chance, you never ask, I can only imagine that it goes stale. You can hope they keep it longer, but who knows? You’re not asking. You’re not giving people a chance to pay you back if you’re not making products for people. This is the situation I’m in, Ben. I’ve got the Community. People can always support the show by joining the Community. They’re like, “I’m on the other side of the world,” but that’s fine. We have people in every time zone across the world. We also have members who, for whatever reason, they’re busy and they can’t always participate in the Community, but they still keep a subscription because they want to support us. If people really value what you’re doing, they’ll find a way to support you. 52:24 Other than that, I have Learn Lettering. Unless you want to learn lettering or join a community membership site, I don’t really have products for you right now. That’s the thing I’ve had to correct. I haven’t given people enough ways to pay me back for the value, which is why I’ll go ahead and sell right now. Supercharge Your Writing is a workshop I’m doing on November 9th. 2015. It’s going to be a live online workshop where I’m going to teach you how to grow your business with writing. We talk about it a lot, but this is going to get down to brass tacks, down to earth practical stuff for you in this workshop. I’m going to answer questions, you can download the replay of it, get worksheets, and all that stuff. I’m selling this workshop. It is not free. For once, something I’m putting out there to help people is not free. Yes, you pay for it. No, I’m not apologizing. 53:27 StartSendingDailyEmails.com is going to be turning into a course about email marketing, telling you how to effectively sell with email marketing and do it the right way. Also, I’m going to be teaching on it, so you can sign up and learn from me, but I will also be selling in these emails and showing you how to do it as I do it. It’s very meta. That’s another thing I’m going to be selling. Also, on November 11th, 2015 we’re doing the Value-Based Pricing webinar, where we’re doing some more teaching and opening up the pilot program for Value-Based Pricing, the beta run. 54:17 It’s different audiences, so some people might overlap, but it’s pretty different. Supercharge Your Writing is for people who know that they need to start doing content marketing, they need to start writing to get the word out there and provide value, but they haven’t started doing it. Value-Based Pricing is more for people focused on client services and pricing that. They know that they’re doing great work, they’re charging thousands already, but they could be charging tens of thousands and they don’t know how to break through that ceiling. I’m starting to develop these in-depth products that teach people very specific business skills, so I’m starting to put out things people can actually purpose as a way of giving back. If I’m so focused on the long term that I don’t sell in the meantime, then the reciprocity can expire. 55:24 Ben: Aaron says, “People remember someone who provides value for a very long time. I’ve bought things from bands who have waited ten years between album releases.” In that ten years, styles evolve and change. Your message evolves, your values might change a little bit. The things you’re sharing right now, the value you’re providing right now for your specific audience does have a shelf life because things change. The brand impression of being a person that provides value doesn’t go away. They’ll continue to follow you and they may buy from you in the future, but what they buy from you in the future isn’t necessarily going to be directly connected to the value they received from you ten years ago. Connect something to the value you’re providing now and connect something to the value you’re going to provide ten years from now. 56:34 Sean: The future thing doesn’t go away, it’s just that you’re not capitalizing on the reciprocity you’ve built in the short-term if you’re all long term. 56:45 Ben: It may be that there are some people who won’t buy from you right now because they can’t and they’re okay being freeloaders. 56:55 Sean: I get emails about this, probably in the mid-400s now. We’re putting out seven seanwes TV videos and podcasts daily at seanwes.tv/itunes. Why are people not listening to this every single day? It’s under ten minutes. Daily podcasts, daily videos, daily posts. Three podcast episodes, and now we’re doing seanwes TV digest weekly. I’m producing these three courses. A month from today, there will be three new courses. This is insanity. I can’t respond to every single email, I just can’t do it. I see some of them, but I just can’t. 57:50 I realize that we had an intervention. “Look Sean, can you help more people and provide more value if you focus on what you’re doing now, putting out things into various channels that help thousands of people, or should you focus on just this one person?” I have to focus on the thing that will have maximum impact. Eventually, I’d like to get to a point where I can manage this, but I’m not in that position. I talked about going on a retreat recent solo episode and the guys there saying, “Sean, you’re giving away too much. You need to start selling. Stop giving away everything for free. Ask your audience.” I did in that episode (Related: e209 Unsolicited Advice – Recap of A Mastermind Retreat). I said, “Go to the Community. Are you appreciating what we’re doing? Go support us. This is my ask.” Maybe people will get mad, maybe it pays off, but this is my ask. 58:49 I did that in this episode. I said, “No more waiting, no more lagging, no more freeloading.” Someone got upset. Guess what? If I’m providing value and you have no intention of paying me back, yes, it is free. Some lady wrote to me and said, “Did you just say that free isn’t free?” I said, “No, it’s free. If you make a decision in your mind never to pay me back for the value I’ve given you, I reserve the right to call you a freeloader. That’s how this works.” I interrupted you a couple minutes ago, Ben, because you said, “If they can’t afford to buy something right now and they want to freeload,” this is where I wanted to make a clarification. If someone can’t afford to purchase something from me, I don’t consider them a freeloader. A freeloader is someone who decides in their mind to never compensate for the value they’ve received. 59:47 If someone says, “You know what, Sean’s given me a lot of value. Some day, if he puts out the right product and I’m in the right position, I’d like to pay him back,” if that’s what they think, it doesn’t matter if the transaction has occurred or money has exchanged hands. They are not a freeloader to me. If we lost those listeners, too bad. If you’re still listening, hopefully you get it now. I’m not saying you’re a freeloader if you haven’t paid me back. 1:00:53 Sean: We’ve got some more questions, and I’m excited about these. “Can you convert something you gave away for free into something you can sell?” Absolutely. If you promised, “I will never charge for this,” don’t go back on your word. I know that for the starter class of Learn Lettering, which is worth $99 and I gave it away for free, I promised that people will always retain their access. I’m not going to revoke that and charge them for it, but I don’t know that I ever said I won’t ever start charging for it. I never explicitly said that. Don’t go back on your word, but if you’ve been giving away stuff for free, you absolutely can sell it. You can start charging for it. 1:01:54 Sean: Oh yeah, they’ll get so mad, but they were never your customer, so it doesn’t matter. 1:02:05 Ben: They’re not going to ever value the thing as much as a person who will compensate you for it. Some people already receive the free value, they see that you’re selling something and that it’s the same thing they already consumed from you, and because they appreciate the value you provided, they go ahead and buy that thing, even though it’s not something they need anymore because they’ve already gotten that from you. If you’ve been giving away free content, that’s the first place you should look for something you could turn into something to sell. You don’t have to make something completely new, but look where you’ve already been providing value, where your message has already been resonating with people. 1:02:54 Sean: Why do people listen to this show? I can only imagine that it’s because they’re bettering themselves as people, growing their business, and making more money as a result of applying the advice we’re giving on this show. I can only imagine that is the reason they listen, yet people get upset when I sell. How can I teach them to provide value, to build an audience, to support themselves and make a living from it if I’m not practicing what I preach, which is selling, which is what you have to do to make a living at something? You can’t. If you don’t get that, I can’t help you. I’m here to help you, and if I’m going to help you, then I have to demonstrate. I have to lead by example and practice what I preach, which means, sometimes, I need to sell. 1:03:56 I’m going to edit that last statement and preface it with a question. Cory Miller had asked, “How often should you sell? What should be the ratio of giving away value for free to selling?” My answer that I had pre-written here was, “Always be selling.” I had just said, “Sometimes be selling,” but you should always be selling. 1:04:23 That’s how people are going to get more out of something. That’s how you’re going to be sustained in helping people with stuff. Don’t ever apologize for selling. We get in this value overload mindset, where you have to provide value—which I think you should—but you have to provide so much value that the person feels compelled to buy the one time you ask. If we say that people don’t notice announcements, they notice consistency, why do we think they’ll notice when we sell one time out of the 20 times we give value? 1:04:58 Ben: For every one or two people who are super sensitive to selling, who come out of the woodwork to actually say something, there are so many others who don’t even notice. If you feel like you’re over-selling, you’re not. If every time you say something, you’re providing value but also selling, you’re still not overdoing it, because people don’t notice. They’re not nearly as aware of it as you are. For the most part, people aren’t as aware of it as those sensitive few who voice their distaste with sales in general. 1:05:40 Sean: We forget that when we’r providing value and even selling every time, we’re still doing way better than most people. Most people just come up and sell. Your phone rings, and it’s a telemarketer. Why do you think they keep doing that? Do you think they keep doing that if they’re losing money? No, it’s because it works. You get annoyed, but someone else buys, and they didn’t even provide value. If you’re providing value at all, you’re already ahead of the game. You earned the right to sell. It’s a business, not a charity. 1:06:41 Emily says, “How do you find balance between consistency and driving people away with repetition?” She’s talking in the context of selling, so this ties in. Provide unique value. Provide (give) unique (different every time) value (something that helps people). If you don’t have enough unique value to provide around the thing that you’re selling, then you probably don’t know the thing you’re selling, that subject, well enough to even be selling it in the first place. Let me break that down. 1:07:24 If you’re selling something and you can’t find a way to provide unique value around it every time you announce it, you don’t know your subject matter well enough to be selling. If you have something to sell, the wrong way to do it is to say, “Buy my thing! Buy my thing! Buy my thing!” Ring the phone, ask the person, get a no, ask again until you get a yes. I don’t like that route, that’s the wrong way to go about it. If you’ve got a t-shirt to sell, tell the story different ways in different mediums. Write a blog post about the process, about the story, the printing, the details, the shipping, the experience, and then do it all over in different mediums. Make a video about it, make a podcast about it. 1:08:31 Ben: Regardless of how practical or nice-to-have your product is, story telling opens up a whole world of content that you can provide. I want to encourage people to always be thinking about how they can tell the story of this thing. 1:08:52 Sean: That’s kind of the answer to this other question, too. Brent asks, “How do you revive and breathe life into an old product without sounding like a broken record or looking desperate to sell it?” Story and value. 1:09:12 That’s how you breathe life into an old product. I’ve changed. Over the years, since the beginning, I was way too timid. I had a lot of things right, like providing value, Relationship Marketing, the Rule of Reciprocity, give, help people, and keep giving, but I didn’t do enough of the asking, of the selling. If I were to do it over, I would pair those together. I’d realize that I have to earn the right to think long-game, and we have to ask, we have to sell. I should not feel guilty for selling, because I’m making someone’s life better, and if I give it away for free, fewer people will benefit because they won’t take it as seriously. I guarantee you, the people who bought the first version of Learn Lettering valued it more than all the new material I produced in 2.0 that we gave away for free. A few days ago we passed 10,000 students with Learn Lettering since the launch—t took 74 days from the launch. It’s insane and it’s an awesome accomplishment. 1:10:59 I also know that I did that because I wanted the word to spread around. The people who got $99 worth of stuff for free—that’s not a fake number because I sold a similar module for that price a year ago—I know that they don’t value it as much as the people who paid for it. I know that those thousands of people are not applying it right now because they didn’t invest. That’s just a reality. 1:11:33 Ben: It’s a great reminder. I need to hear that over and over again, that when people purchase something, they value it enough for it to actually benefit their lives and make it better in the way you hope it will. That’s why selling is not slimy or yucky, but it’s a privilege. It’s a way we get to help people make their own lives better. 1:12:06 Sean: If you spent blood, sweat, and tears making something you truly believe makes people’s better, if you don’t sell, you’re doing them a disservice. Stop thinking about you, stop thinking, “I don’t want people to think I’m tooting my own horn or bragging,” stop thinking about you in this equation. Think about them, and channel your energy into that.